Work has begun on the demolition of Drillers Stadium. 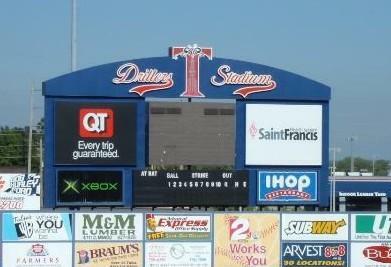 Drillers Stadium was home to the Tulsa Drillers minor league baseball team from 1981 to 2009. The Drillers moved to ONEOK Field in 2010. County officials had hoped to make a deal with USA BMX to build the organization’s new headquarters and arena at the ballpark site, but the deal fell through over a disagreement on concession rights. It is now scheduled to be built at the former Evans-Fintube property north of downtown. Drillers Stadium has been used sporadically since the Drillers left. A soccer program operated there for a short time, but in the past several years, the stadium property has been used for storage and fair parking. The Tulsa County Public Facilities Authority, which oversees the fairgrounds, sold the stadium’s seats and lights a few years ago. Andrus said the former Health Department building has been closed for at least three years. The short-term plan for the 7.5-acre property is to use it for parking and as a staging area, Andrus said. The idea “is to make it look as nice as possible for our neighbors,” Andrus said. County officials have no long-term plan for the property, but Andrus said he expects interest in the property to be strong, especially once it is cleared. “It has been surprising that we have not had more serious inquiries about that corner,” he said. “I think it has been in such disrepair for the last three or four years, and it is just not on anyone’s radar. Andrus said the demolition is being done now because funds have finally become available to do the work. Expo Square is using approximately $560,000 in Vision Tulsa funds to pay for the demolition. In all, the fairgrounds received $30 million in the sales tax package, much of it going to pay for the construction of a new barn.